Being one of the most prominent manufactures and exporters of various engineering products, we are involved in offering our esteemed clients a huge gamut of Powder Blender / Mixers. Our comfortable and user friendly machineries are manufactured by using superior grade components and modern technologies. Entire range of our machineries is followed by international and national industrial standards. Intricately designed these equipments are applicable in various industries. Nano literally means small. As the name signifies the Zeutech Nano Blender is a smaller version of Zeutech Powder Blender or Powder Mixer. It is an innovative, efficient, advanced and sophisticated machine for homogeneous blending or mixing or emulsifying or dissolving of dry and wet ingredients into fluid stream. This is an excellent machine for in-line mixing and homogenizing. In-line homogeneous mixing is the need of the hour for many industries, because the performance and sophistication of powder blenders outshine the other conventional methods. Nano Blenders save time by reducing recirculation requirement. It’s high shear rates reduce blend times and ensure consistent product results. More than 25 years of extensive experience coupled with advanced cutting-edge technology and precise engineering calculations has made us the leading Nano Blender manufacturer and exporter. Predominantly used in milk reconstitution and stabilization, ice cream mix preparation, sugar dissolving etc. the Nano Blender can be used in numerous applications. The tedious task of sugar dissolving is addressed quite effectively by Zeutech’s Sugar Dissolving System. The sugar dissolving system comprises of a powder blender, recirculation tank, filters piping and fittings etc. according to various needs. The Zeutech Powder Blender or Powder Mixer is an innovative, efficient, advanced and sophisticated machine for homogeneous dissolving of sugar into the fluid stream like water, milk or any other solvent. This is an excellent machine for in-line efficient sugar syrup or sweetened solvent preparation. In-line homogeneous mixing is the need of the hour for many industries, because the performance and sophistication of the powder blenders outshine the other conventional methods. Powder Blenders saves time by reducing recirculation requirement. It’s high shear rates reduce blend times and ensure consistent product results. More than 25 years of extensive experience coupled with advanced cutting-edge technology and precise engineering calculations has made us the leading Sugar Dissolving Systems manufacturer and exporter. 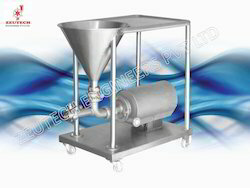 Zeutech Powder Blender or Powder Mixer is an innovative, efficient, advanced and sophisticated machine for homogeneous blending or mixing or emulsifying or dissolving of dry and wet ingredients into fluid stream. This is an excellent machine for in-line mixing and homogenizing. In-line homogeneous mixing is the need of the hour for many industries, because the performance and sophistication of powder blenders outshine the other conventional methods. Powder Blenders saves time by reducing recirculation requirement. It’s high shear rates reduce blend times and ensure consistent product results. More than 25 years of extensive experience coupled with advanced cutting-edge technology and precise engineering calculations has made us the leading Powder Blender or Powder Mixer manufacturer and exporter. Predominantly used in milk reconstitution and stabilization, ice cream mix preparation, sugar dissolving etc. 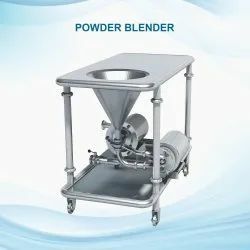 the Powder Blender can be used in numerous applications. Devours lumps, clumps, and fish-eyes. E. L.-26/4, J Block, M. I. D. C.